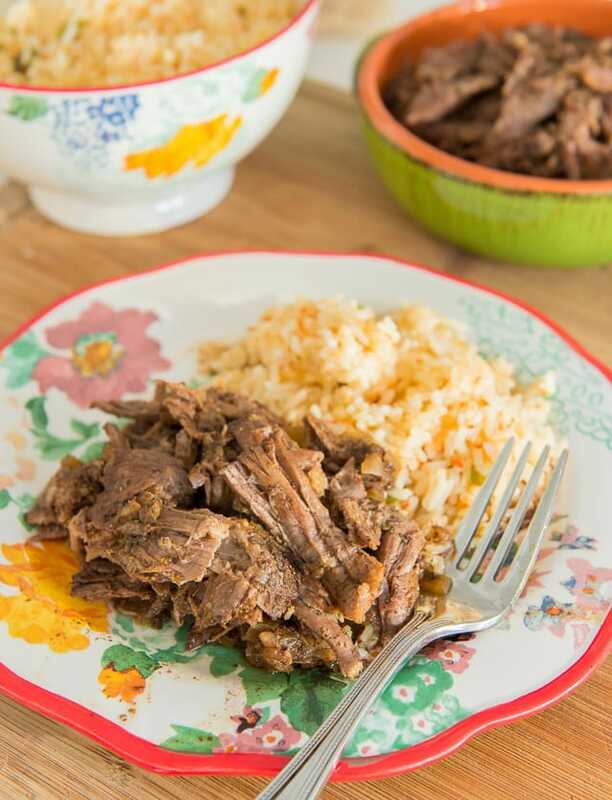 This Slow Cooker Shredded Mexican Beef couldn’t be any easier. 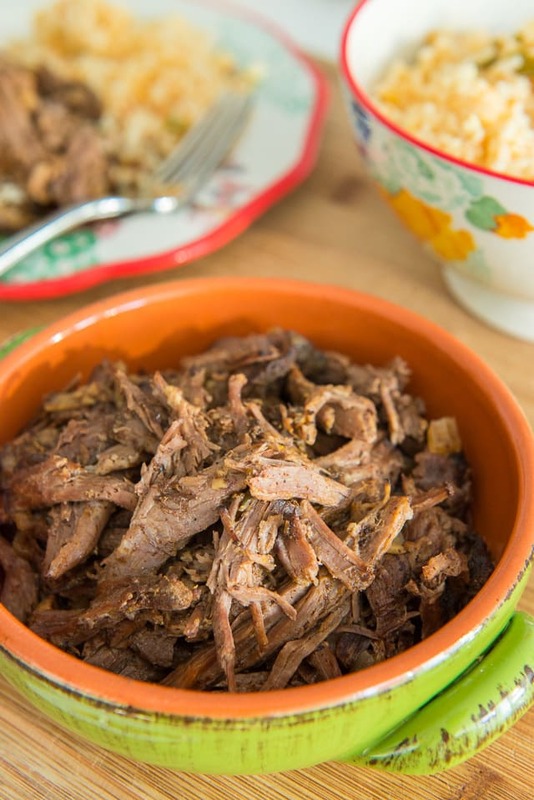 Throw a handful of ingredients into the crockpot, set for 4 hours, then shred it up! I feel a little silly saying this, especially as someone who’s willing to make tedious things like puff pastry from scratch, but I find it to be such a drag when you come across a slow cooker recipe that calls for a lot of prep. You know, the recipes where you have to saute the onion before putting it in the crockpot, or sear the meat beforehand. Can’t I just throw it all in and turn the dial? That’s my ideal slow cooker situation. And when I really think about it, I don’t find that to be unreasonable, because if it’s not a “throw it all in and turn it on” situation, I’d rather do all the sauteing and browning in a dutch oven and do a slow braise in the oven anyway. 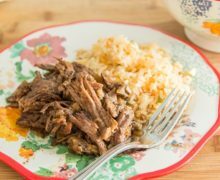 Today’s recipe for Slow Cooker Mexican Shredded Beef is a true “throw it all in the crockpot and turn it on” situation. I love eating it alongside a simple Mexican rice and homemade Guacamole, and eating leftovers for days and days. The boneless chuck beef cut we’ll be using is nice because it’s not too fatty, but it shreds beautifully. 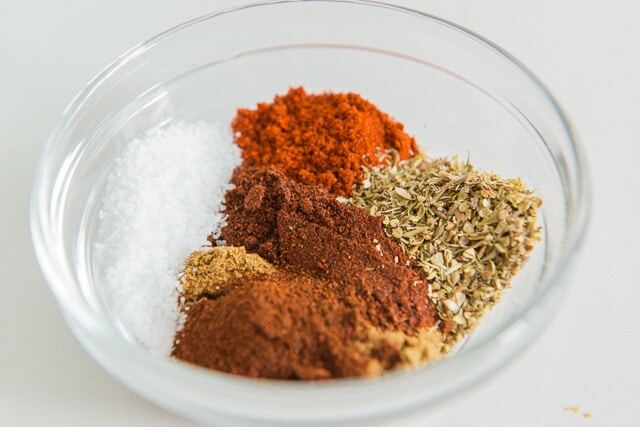 To get started, we’ll make our spice mix. Here I’m using cumin, chile powder, ancho chile powder, oregano, chipotle chile powder, and salt. I like having a variety of different chile powders in there, but if you must, you can just use one. Cover and cook for four hours on high, until the beef is fork tender. Shred it all up with a fork, then it’s ready to be served. I like pairing it with Mexican rice, and you can also round out the meal with some homemade guacamole, homemade salsa, and chips. Enjoy! And because I always get asked, this is the slow cooker I use, and as of this post it’s $12. It doesn’t have any bells or whistles but it has held up for a few years already and does the job. 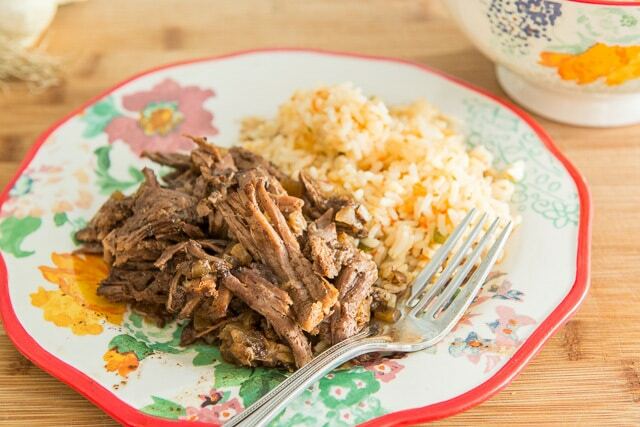 This Slow Cooker Shredded Mexican Beef couldn’t be any easier. 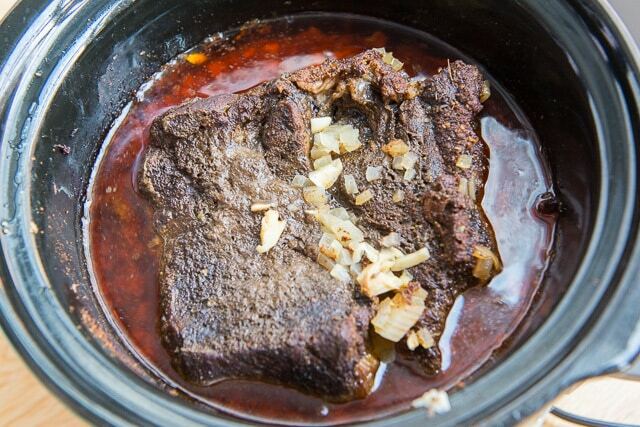 Throw a handful of ingredients into the crockpot, let cook for 4 hours, then shred it up! In a bowl, stir to combine the cumin, chile powder, ancho chile, oregano, chipotle chile, and sea salt. 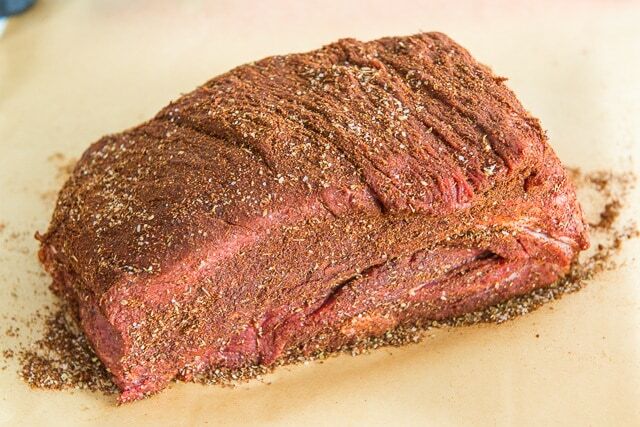 Rub the beef all over with the spice mixture. 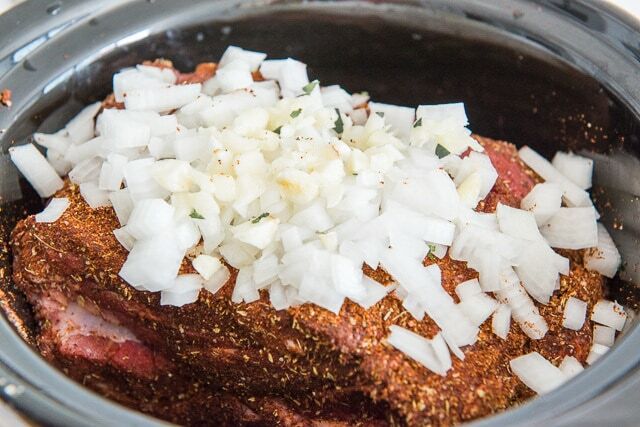 Place the beef in the slow cooker, then sprinkle the onion and garlic on top. Cook for 4 hours on high, until the beef easily falls apart when pulled with a fork. 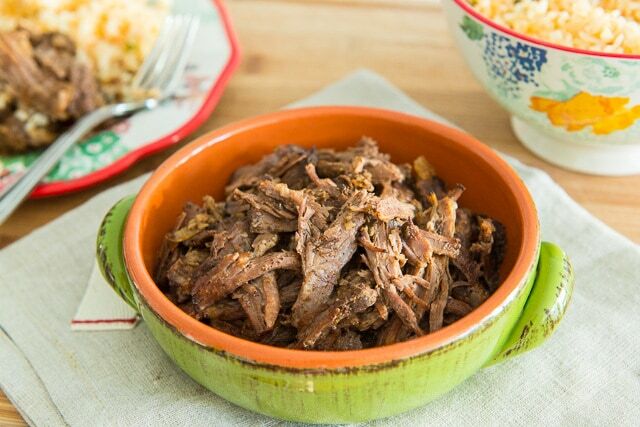 Shred the beef and enjoy! I make this at least once a month and the whole family loves it.